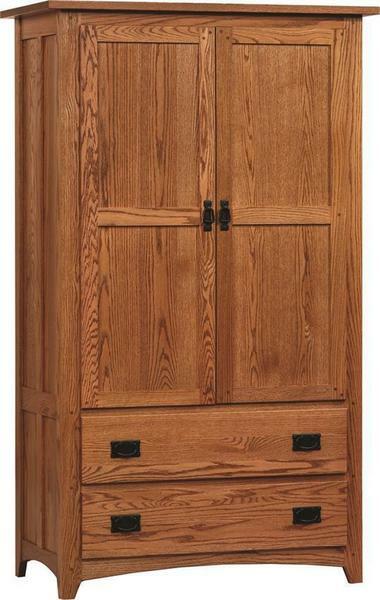 When floor space is at a premium, but you need more storage for your wardrobe, our Amish Classic Mission Deluxe Armoire is the perfect choice. Featuring two large, paneled doors that open to give access to three adjustable shelves, you'll have plenty of room to store your folded items and everyday necessities for easy access at any time. 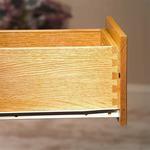 Below, two (or three) large drawers will provide more clothing storage for your space. Each drawer offers a quality dovetailed drawer box that is mounted with full extension slides, opening completely away from the framework of the armoire to allow access to everything inside. 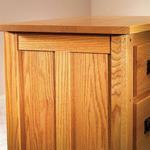 Upgrade your armoire to include pocket doors, a TV swivel, and matching DVD/cable stand. Combined, these options with transform your armoire into an entertainment cabinet that is perfect for housing your TV, when you need to catch your favorite episode, and maintains a tidy appearance when not in use. Customize this armoire to match your unique tastes and decor by choosing from one of nine different premium hardwoods. Each one offering a unique look that is sure to have a big impact on your bedroom decor. One you've chosen a wood, you can select from an array of different finish options that get the right tones to match any room in your home. Finish it up with the standard Mission hardware (as shown) or chose from Queen Anne or Traditional hardware to provide a different look. Please give us a call with any questions you have about our Troyer Bedroom Collection. We can provide stain samples to help you with your decision, along with a free custom quote if there was something special you had in mind for your new armoire. 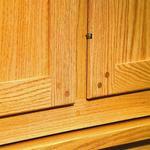 Each piece of hardwood furniture we craft is made to order, just for you. Call today to start your order and let us help you furnish a bedroom oasis that you can love for a lifetime.